- Changing The Planet -: Trump-Obamics. 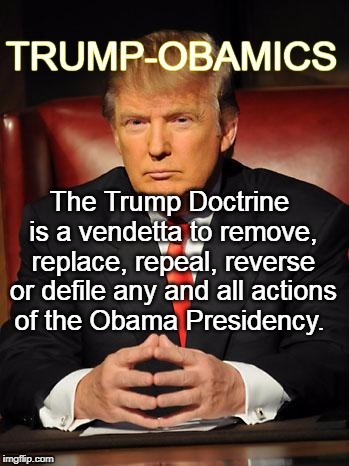 The Trump Doctrine is to reverse all Obama Era Actions. Authorized in 1996, the Congressional Review Act gives Congress 60 ​legislative ​days to ​revoke rules with the assistance of the president. ​Before this year, it had just been utilized once someone do my essay; since Mr. Trump took office, administrators have utilized it to turn around 14 Obama-period rules.